Most Sundays you'll find Michael Helbing on a trail somewhere, leading groups of outdoor enthusiasts on 15 to 20-mile hikes. He puts more than a thousand miles a year on his sneakers at locations throughout the state, but the Highlands Trail holds a special allure for him. 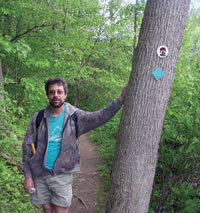 Mike Helbing on the Highlands Trail, marked by a teal blaze. These mountain laurels are near the Headley Overlook in Jefferson Township. To hike the Highlands Trail is to journey along the spine of Northwest New Jersey, on a path that showcases the best outdoor, ecological, historical points of interest the area has to offer. "I absolutely love this trail," Helbing remarks. "It highlights the diversity of our area. It really promotes it." That diversity includes deep forests, spectacular vistas, waterfalls, small rural communities, and remnants of historic features such as the 19th Century Morris Canal and iron industry areas that date to colonial days, now reclaimed by forest. "Everything that made the Highlands a bustling place is highlighted on the trail," says Helbing, who helps to scout out potential routes as sections of the trail continue to be developed. The Highlands Trail was proposed in the early 1990s when serious attention was first given to the geological region known as the Highlands. Stretching from Connecticut to the Pennsylvania-Maryland border, the region supplies drinking water to more than half of New Jersey's population, leading to state restrictions on development in the area. Work on the trail began in 1995, as it became one of the first and most recognizable initiatives to promote recreation as a preservation tool in the region. Rather than establish a completely new trail, the Highlands Trail is a combination of co-alignment on established trails, new trails and road walking. Although work continues to create a contiguous footpath, and some existing sections still need to be marked with trail blazes, the Highlands Trail is essentially complete from Storm King Mountain in New York State to Spruce Run Reservoir near Clinton in Hunterdon County. When finished, it will run some 150 miles, and much of the route traverses New Jersey's Skylands region. From New York, the trail meanders south into Passaic County and crosses into Morris County at Route 23, near the Oak Ridge Reservoir. From here, it traverses the Pequannock Watershed, then continues south through Mahlon Dickerson Reservation in Jefferson Township, northeast of Lake Hopatcong. While a few significant sections of trail are still missing from Mahlon Dickerson to Route 181 north of Lake Hopatcong, as well as from Stephens State Park to Long Valley, long continuous trail hikes are now possible in most places. Glenn Oleksak, on the HT the day he rerouted some of the trail in Stephens State Park. Photo by Mike Helbing. "Until recently I was apprehensive about seriously advertising the trail because it was segmented. Now, with so much of the trail complete, I really feel like we can promote it," says Glenn Oleksak, supervisor of Highlands Trail work in New Jersey for the New York – New Jersey Trail Conference. "We have a trail to be proud of," adds Oleksak, who can speak from first-hand experience. Oleksak has through-hiked the entire Highlands Trail from Riegelsville, NJ, in the southernmost corner of Warren County, to Storm King Mountain several times. Helbing says he finds it amazing that here in the most densely populated state in America, with all the difficulties that face a project like this, so much of the trail has been completed in the short span of a decade. The character of the Highlands Trail is unique in that it does not consistently follow a ridge line like the Appalachian Trail. Moreover, it does not have a continuous improved surface like many other trails. "It's really like the last of the old time trails. For the most part, it's a rugged footpath designed for foot traffic only," says Bob Moss, who oversaw work on the trail for nearly a decade. Moss takes great pride in the trail and its minimal environmental impact, explaining that many newer trails and parks feature paved trails or ones surfaced with crushed stone. In many spots, the Highlands Trail has a higher level of difficulty than even the Appalachian Trail, as it crosses the rolling hills and mountains that characterize the Highlands Region. Within the Skylands region, the trail is continuously blazed from Route 23 and Canistear Road to the Mahlon Dickerson Reservation; from Route 181 north of Lake Hopatcong to Mine Road in Stephens State Park; and from Long Valley to Clinton Wildlife Management Area near Spruce Run Reservoir. From here, the trail traverses Charlestown Reservation, Tower Hill Reserve, Jugtown Mountain Preserve, and continue through Musconetcong Gorge as it heads toward the Delaware River. The Appalachian Mountain Club has become active in the region, and plans to oversee the extension of the Highlands Trail well into Pennsylvania while promoting the region's critical treasures. The AMC has recently labeled the Highlands as "Our Back Yard Paradise." As a work in progress, the Highlands Trail can be visited again and again, with hikers returning to see how it develops as they follow the teal-colored, diamond-shaped blazes that mark the trail's route. And while the Highlands Trail spans long distances, you don't have to be a through-hiker to enjoy it. "I like the fact that you can make little loop hikes out of it," said Helbing, who described a few of his favorite sections. Unlike the backpacker-friendly Appalachian Trail, camping is not permitted along the Highlands Trail. However, to combine a camping weekend with some Highlands Trail hikes, the perfect spot could be the Mahlon Dickerson Reservation. The largest of the many parks in the Morris County Park System, it includes some 3,200 acres of recreational areas and near wilderness, and more than 20 miles of multi-use trails. Camping areas in Mahlon Dickerson include tent sites and Adirondack shelters, as well as a trailer area with electric and seasonal water hook-ups, picnic tables and charcoal grills. 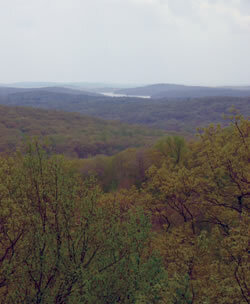 The view from Headley Overlook with some of Lake Hopatcong in sight. The highest point in Morris County, at 1,395 feet above sea level, is found along the Pine Swamp trail in Mahlon Dickerson, but Helbing particularly recommends a trek that includes the Highlands Trail and features a stop at the Headley Overlook, another lofty spot in the park. "The distance you can see really illustrates how unspoiled a lot of New Jersey still is, to have such scenery," Helbing enthuses. To start your hike, park at the north end of Saffin Pond, off Weldon Road, and head south on the HT to the east side of the pond. The south end of the pond offers a picnic area. As you continue following the teal blazes, one finger of Lake Hopatcong comes into view, offering one of the few backwoods overlooks of New Jersey's largest lake. A dam expanded the lake considerably in the first half of the 1800s, creating a water supply for the Morris Canal at the canal's apex in its climb over the hills of northern New Jersey. 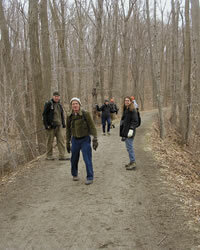 Bob Moss shows the way along the former Ogden Mine Railroad in Mahlon Dickerson Reservation. Photo by Mike Helbing. The hike starts out with a flat and easy stroll on the former right-of-way of the Ogden Mine Railroad, built in 1865 to transport the iron ore from local mines until it was abandoned 70 years later. The trail shifts from an improved bed of crushed stone to old wood roads, to more narrow trails, past some impressive rock faces, and, nearing the Headley Overlook, it intimately winds between the mountain laurels. Further along, the trail takes the hiker over large, flat pieces of mantle rock. After heading south, the HT veers to the northeast on the way to the Headley Overlook, accessed by a short but steep climb. Stop here to drink in the view that stretches for miles over the hills that give the Highlands its name. Shortly after the overlook, a left turn onto the yellow-blazed trail will take you back to the parking lot. Of the three hikes suggested by Helbing, this stretch of the Highlands Trail is the easiest. An interesting and diverse "out and back" hike (you'll have to retrace your steps, or team up with another hiker to shuttle a car to your stopping point) starts at Stephens State Park, off Willow Grove Street, just north of Hackettstown. Willow Grove intersects with Route 46 –Hackettstown's Main Street–at the east end of town. Head north for two miles, passing Hackettstown Regional Medical Center, and turn right into the park, named for members of the Stephens family, a northwest New Jersey clan with roots dating to the 1700s that donated the park land to the state. A bridge across the Musconetcong River leads to a parking area by the ranger station, and the Highlands Trail's teal blazes are found a bit upstream, as the trail enters the woods near the rest rooms. The six miles of marked trails in Stephens State Park for walking, hiking, mountain biking and horseback riding include a two-mile section of the Highlands Trail that runs the length of the park. With campsites for tents and small trailers, this park offers another opportunity to combine sleeping in the woods with an HT hike. This Warren County section of the Highlands Trail actually starts on the Morris County side of the river. The trail follows a level but narrow footpath, then turns left to follow a wider, crushed stone surface. Continue following the trail blazes to Waterloo Valley Road and turn left to cross the Musconetcong River back into Warren County. Follow the road to Willow Grove Street and turn right. After a railroad crossing, Willow Grove becomes Waterloo Road, and you'll come to a house on your left surrounded by a fence. At the far end of the fence, the Highlands Trail makes a 90 degree turn to follow the fence uphill to the Morris Canal towpath. Here the canal prism is well preserved and retains water when it rains, helping you to envision the canal in its heyday, as canal boats made the 106-mile trip between Phillipsburg on the Delaware River and Jersey City on the Hudson. Continue along the towpath and you'll come once again to Waterloo Road, where the canal crossed to Saxton Falls. A lock between the canal proper and the slack water section created by damming the Musconetcong existed here, and, although the lock was filled in, the top of its stone walls remain visible. An outline of a canal boat in the lock is painted on the pavement "to give you an idea how tightly the boats fit in there," Helbing says. From here, the Highlands Trail continues on the towpath. "It's a beautiful walk along Saxton Lake," Helbing adds. Keep following the teal blazes and you'll turn left off the towpath by an abandoned house. However, Helbing recommends a short detour, staying on the towpath as it continues on a causeway into the lake. At the point where you can go no further, enjoy the view as you are almost completely surrounded by water before retracing your steps back to the abandoned house to follow the Highlands Trail. From here, the trail follows a small road back to Waterloo Road and continues to switch between the road and the canal towpath, where it's accessible. Continue all the way to the Route 80 underpass–you'll have walked just about five miles–to see more canal era remnants. The HT crosses the Scout Run in Musconetcong Gorge, where the tumbling waters are aweseome, especially after a good rain. Photo by Mike Helbing. Part of Hunterdon County's park system, Musconetcong Gorge features cascading brooks, views, a nature trail, and historic remnants of an abandoned paper mill and the railroad and power canal–the channel diverting river water to the mill–that served it. Access to the trail is off Route 519, just south of the Musconetcong River and the county's border with Warren. Turn onto Dennis Road and travel 0.6 miles to the parking area on the right (located at a sharp bend in the road). Highlands Trail blazes can be found at parking lot, and you can pick up a pamphlet there for nature trail section of your hike. As the hike begins, the Highlands Trail with its teal diamond blazes is co-aligned with the Ridge Trail, with white blazes. Head into the woods, across a small stone bridge and along the ridge, and the trail descends a bit to a cascading brook called Scout Creek. Across the brook, the trail branches off and continues along the ridge offering good seasonal views, particularly when foliage is down. "Early spring it's absolutely great," Helbing notes. To make this a loop hike, start paying more attention to the Ridge Trail's white blazes. 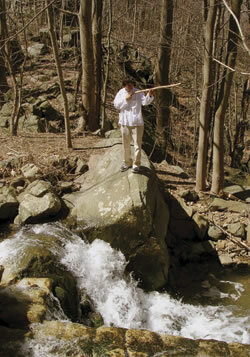 At the next creek, Pine Run, follow the trail downhill along small cascading waterfalls to the abandoned right-of-way of the Lehigh Valley Railroad spur that serviced two paper mills in Warren Glen area. Turn left for an easy, flat walk on the right-of-way until you reach the "phantom bridge"– there are a couple of bridge abutments, but no actual bridge remains to take you across the river. Turn left following the blazes off the right-of-way, uphill on an old service road, then look to the right for the nature trail. There is a nice wooden bridge over Scout Creek near the start of the nature trail, and this trail loops you back to parking lot where you began. Allow for several hours, depending on your pace, as the trail can be strenuous. The Highlands section is a narrow trail with rocky footing, and can be steep, but it offers a good nature experience, as it is secluded and little used.